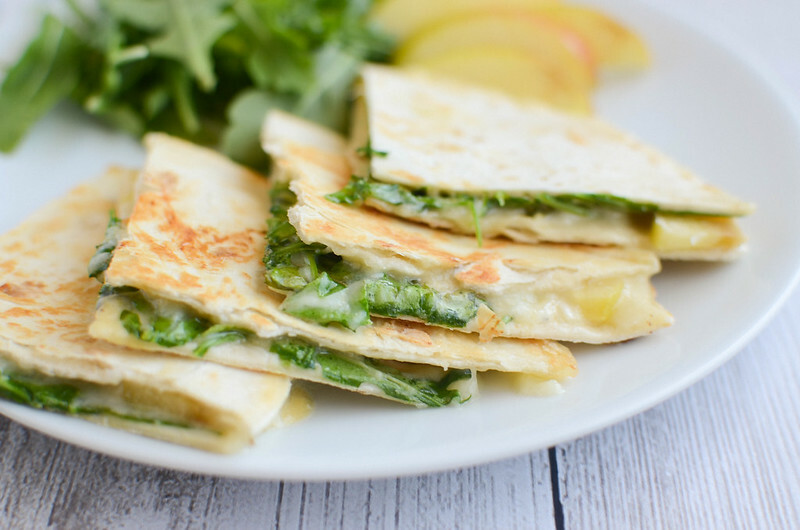 Apple and Brie Quesadillas – easy and delicious meatless meal! Crisp apples with melty brie and peppery arugula. Is it really Monday again? How did that happen so fast? Well how was the weekend? I hope it was fantastic! Ours was good. It is still so stupid hot here in Texas that I kind of didn’t want to do anything. Like even running to Walmart (as I’m doing every other day right now to look for new pumpkin goodies) seemed too difficult. I keep reminding myself of our Christmas roadtrip last year and how we had to drive through snow in Dallas. C’mon cold weather! C’mon 1/8″ of snow! Despite the weather, I’m still pretending it’s fall. I put out a few decorations, I have pumpkin candles scattered around the house, and every thing I’m baking has apples in it. No surprise that I’m also putting apples in dinner. If you are one of those people who love dipping apple slices in baked brie (me!) 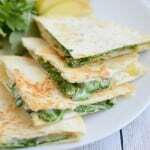 you will love these quesadillas so much! Not only do they have the apples and the brie but they also have a yummy apple cider mustard and some peppery arugula. 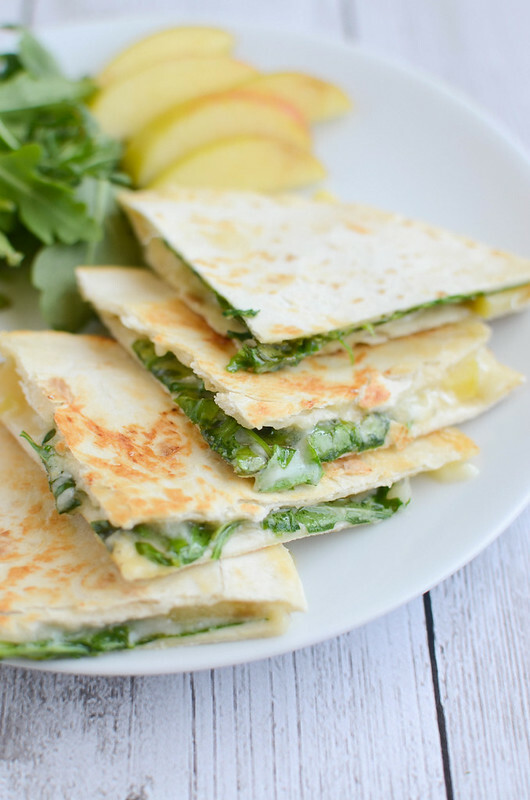 Make these Apple and Brie Quesadillas for a quick and easy meatless meal! 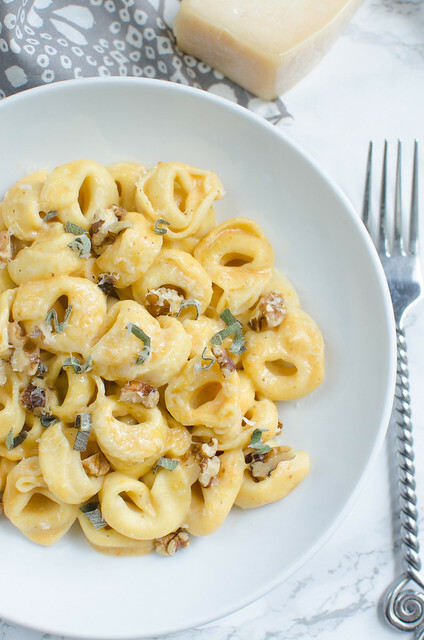 Make sure you sign up for my email list to get new recipes delivered to you every time I post! Heat a nonstick skillet over medium heat. Spread each tortilla with 1/3 of the mustard mixture and place in the hot skillet, mustard side up. Arrange 1/3 of the brie slices on half the tortilla. Once the cheese starts to melt, arrange 1/3 of the apple slices on the cheese and top with 1 cup arugula. 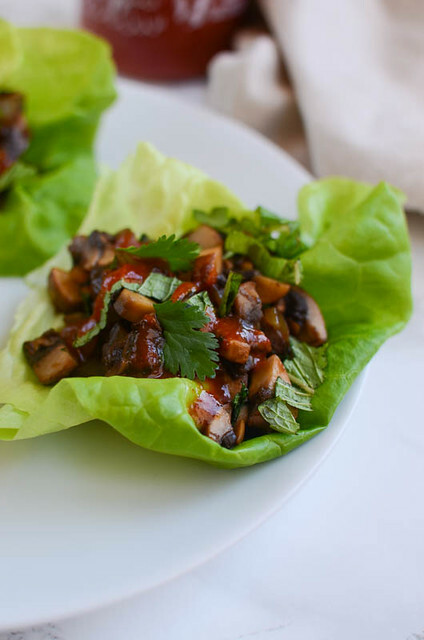 Sprinkle with 1/4 teaspoon black pepper. Fold tortilla in half and press with a spatula to stick the sides together. Cook about 2 minutes or until golden brown, flip, and cook another 2 minutes on the other side. Cut into 4 wedges. Repeat with remaining ingredients. 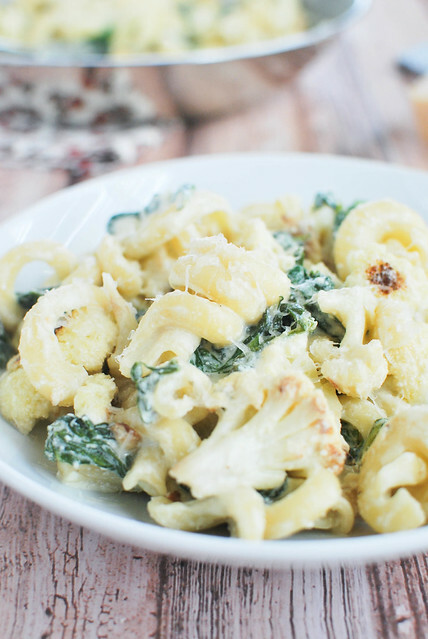 Want more meatless dinner recipes? 7 Responses to "Apple and Brie Quesadillas"
I’m mourning the end of summer – even though ours will last another month, at least. I know, the cheese stands alone. However, I do love fall! And all the food that goes along with it. I need these quesadillas RIGHT NOW. 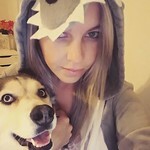 I am definitely ready for some cooler weather! 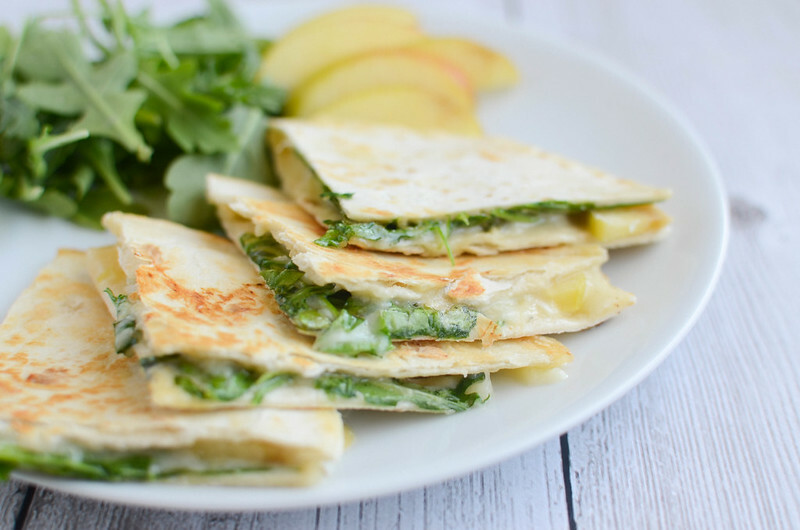 Love the apple brie combo in these quesadillas! I love fall. . it’s my fave season. . I’m busting out the pumpkin candles this week! love these quesadillas!!! love the apple, arugula and brie! yummm!!! Oh, I do love a melty brie…but I have never dipped apples. That needs to change, right?